Grizzly bear from page 344 of Yellowstone Treasures, 4th ed. In a recent press release about preparing for fall, Yellowstone National Park rangers remind us that the park is bear country. Here’s their advice. In the fall, grizzly bears and black bears usually move to higher elevations to feed on whitebark pine seeds, and consume the calories they need to sustain themselves during winter hibernation, but they may be encountered along roads or hiking trails throughout the park. When hiking or backpacking, remember to travel in groups of three or more, make noise on the trail, and be alert for bears. All hikers should always carry bear spray so that it is readily accessible—not inside a pack—and know how to use it. 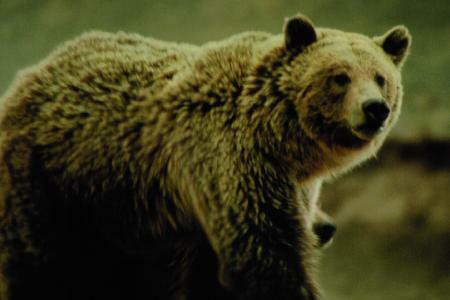 Bear spray is proven to be highly successful at stopping aggressive behavior in bears. It is sold at bookstores, gift shops, outdoor stores, and service stations inside the park, as well as in many stores in the surrounding communities. New this year, bear spray is now available for rent at Canyon Village in a kiosk near the Canyon Visitor Education Center through late September. Happy wildlife watching, and stay safe!